Elegance Sparkle Hurricane Candleholder 8"dia. Home > Sterling Silver, Silverplate, Crystal > Crystal Items > Elegance Sparkle Hurricane Candleholder 8"dia. Elegance® Sparkle Hurricane Candleholder 8"dia. 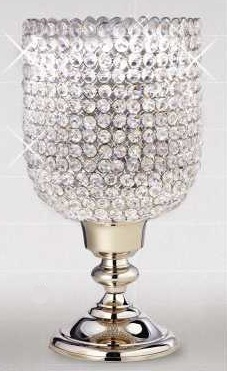 x 15-1/2"h.
An impressive silverplated hurricane style candleholder covered in sparkling crystal beads.